Multi-user games and apps are not new (just look at World of Warcraft), but alongside the rise of the new multi-touch tablets, a new type of user experience is possible: co-located, multi-user applications. In other words, apps which allow two or more people to simulatenously interact together over the same device. What does this mean in UX terms? It has the potential to fundamentally change the way that we collaborate. Traditionally, if we want to work together on the same document at the same time, we would need to either gather around the same laptop, with one person ‘driving’ and the other watching. Or – the more likely option – is to print it out and then transfer it back to digital afterwards. Multitouch tablets has the potential to allow us to do this on the same screen together but with the added bonus of having the computer do some of the computational work. 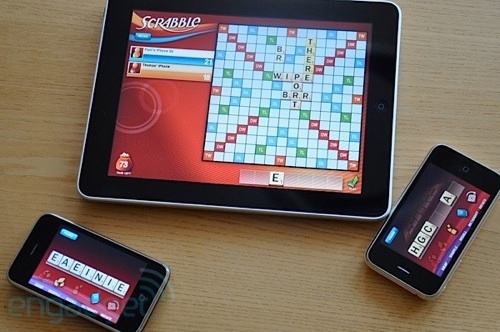 But Scrabble was the 5th highest grossing iPad app for the 2010 – so there is clearly a market of people willing to pay 10 dollars for it. If 2010 is the year of the tablets, then 2011 could be the year that we see even further seamless interactions across devices. Kate – another very insightful post. And another set of predictions that I completely agree with you about and really excite me because I’m working on technology that makes this possible and more easily accessible. For multi-user games and collaborative applications the information about a player move, new document update or chat notification generally needs to be instantly sent to all other users. Even where real-time is not absolutely essential to the application a push notification is still more beneficial (UX and resource usage) than notification via polling. During the last year we started to see, or at least notice, a lot more real-time collaboration applications and games which used the Internet as the network for the messages. In this post I wrote for Programmable Web on real-time client push services the first screenshot is of a web-based scrabble-like game (http://blog.programmableweb.com/2010/09/14/client-push-services-open-up-real-time-to-everyone/). Some other well know examples are Google Docs documents, drawing and spreadsheets real-time collaboration (http://docs.google.com/support/bin/answer.py?hl=en&answer=44680), Google Wave, PBWorks and real-time chat services such as Nurph (http://nurph.com – although they currently use polling). I also think that services such as Balsamiq (http://balsamiq.com/), a UI mocking app, plan to introduce real-time collaboration functionality. I’d love to know what people think about this and hear any idea about how we can solve this real-time notification UX problem. During 2011 I absolutely believe that we will start to see a lot more real-time and cross platform collaborative applications and games where one user may be on a smartphone, another on a PC running in a web browser and another on a native iPad app. These applications will be powered by real-time technologies either hosted by the game or application developers or using one of the real-time push notification and messaging services that started up last year. Wow, superb blog layout! How long have you been blogging for? you made blogging look easy. The overall look of your site is magnificent, let alone the content!. Thanks For Your article about Predictions for 2011 & . I prefer this site it is the ultimate site concerning urban exploration geeks like myself. the law out of circulation. Facebook provides a moderate where folk are interested inside everything offer. or even I achievement you get admission tto consistently quickly.